Working from our Healesville clinic, Dr Emma Zhang (Chiropractor) loves helping people feel better, the way they are designed to be. She practices safe, gentle and holistic chiropractic care, and aims to optimize each patient’s health potential. 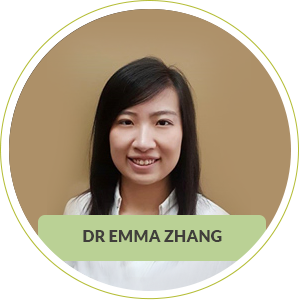 As a chiropractor, Dr Emma Zhang also wants to help patients enjoy improved spinal function. Dr Emma worked as a massage therapist during her 5 year Chiropractic degree and now offers the expertise gained from both her chiropractic and massage qualifications. I believe that if the spine is allowed to perform well, this can help the body to reach optimal health and express its full potential. Dr Zhang completed her Bachelor of Health Science (Chiropractic) in 2015 and Master of Clinical Chiropractic at RMIT University. Passionate about family care and rehabilitation, she practices a variety of techniques. These include Diversified, Drop Piece, Activator Methods®, Dry Needling, and RockTape to a variety of age groups. She has taken continuing education courses in Level 2 First Aid and Dry Needling. When she’s not at the practice, Dr Zhang enjoys travelling, playing badminton and going to the gym.